It’s too hot to eat anything warm after a long day at work. With it so hot out, I have started to make salads that are easy to make, keep in the refrigerator, low in the bad stuff, high in the good stuff, and easy on the purse. 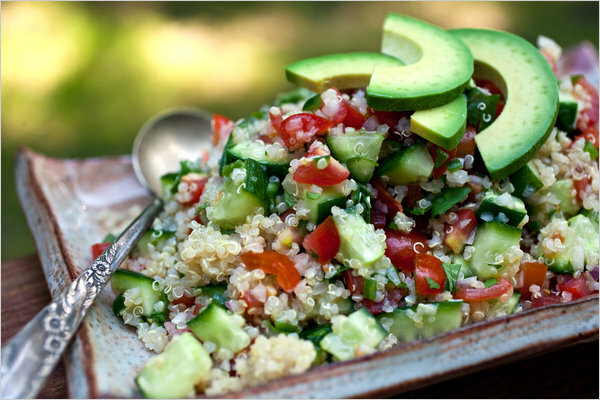 Quinoa is an amazing grain (pronounce it “keen-wa”). While it is considered a whole-grain, it is actually a seed. It takes very little time to cook (similar to rice). It’s very high in protein and amino-acids, as well as gluten-free. It will absorb any flavor you add to it and will keep several days in the refrigerator. To cook, use 1 part quinoa to 2 parts liquid. In 1/3 cup of this prepared wonder-grain there are 160 calories, 2.5 grams of fat, 3 grams of fiber and 6 grams of protein (no, really). Here is a great recipe that I just made courtesy of the NY Times, via Martha Rose Shulman, who writes wonderful cook books on the Mediterranean diet. 1. Bring the 3 cups water to a boil in a medium saucepan. Add salt (1/2 to 3/4 teaspoon) and the quinoa. Bring back to a boil, and reduce the heat to low. Cover and simmer 15 minutes or until the quinoa is tender and translucent; each grain should have a little thread. Drain off the water in the pan through a strainer, and return the quinoa to the pan. Cover the pan with a clean dish towel, replace the lid and allow to sit for 10 minutes. If making for the freezer, uncover and allow to cool, then place in plastic bags. Flatten the bags and seal. 2. Meanwhile, place the finely diced cucumber in a colander, and sprinkle with salt. Toss and allow to sit for 15 minutes. Rinse the cucumber with cold water, and drain on paper towels. If using the onion, place in a bowl and cover with cold water. Let sit for five minutes, then drain, rinse with cold water and drain on paper towels (this reduces the pungent onion flavor).